yoga in India vs. yoga in the U.S. The differences between yoga in India vs. yoga in the U.S. The type of yoga: although you can find this type of yoga back home, I don’t believe it will include the true asana names (from the yoga sutryas) paired with prayers and mantras during the session. When Mataji sings to us she truly warms our hearts. Studio: I usually took hot yoga classes back home, but here we yoga in the natural heat. The doors and windows are wide open and although there are fans to cool us down, they are never on because they out voice my teacher. Surroundings: Instead of a closed up room full of mirrors, I backbend to the foothills of the Himalayas. The best motivation and reminder why I’m in this crazy country. Sounds: no music played here. 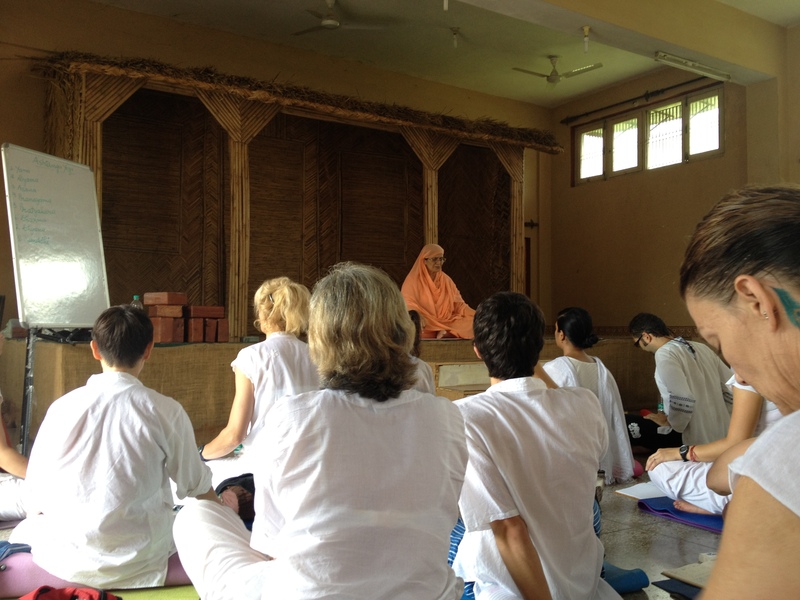 Just the voice of our teacher, the sound of our own breathe, the birds chirping, the monkeys yelling, chants coming from other spots in the ashram, and the occasional relaxing sound of a rain storm. Unexpected visitors: students have been the only distractions in the past, but here we have a different experience. Ants, flies, and spiders are constantly running around our mats and landing on our skin. The stray dog pictured above has decided to visit us often and has snuck up on a few of us in mid-mediation giving us quite the scare. And monkeys will pop their heads in checking on us. During test day they decided to get a little more curious and were playing the back of the room. I had my first monkey attack that day. Yoko (a fellow yogi from Japan) and I were leaving the hall and four monkeys decided to hold the only staircase hostage. They charged at us showing their teeth and one even grabbed my leg. Standing still without a clue of what to do our teacher from below yelled to us to grab the stick (made for this reason) and bang it loudly near them. We did so then sprinted down the stairs. I won’t be leaving the hall in small numbers again and I will always make sure I’m near one of those sticks again. Hope you all have a wonderful week, I’ll try to connect often but I’ve gotten the two closet Internet cafe owners substantially mad at me. One asked why I behave badly after arguing about paying a full hour of wifi when I only used it for 10mins and threw the money on his desk. The other caught me borrowing his wifi around the corner and yelled at me to get inside and pay. I chose to head back to the ashram. Whoops 🙂 Being a headstrong woman in this country is not something the men here like. Oh well, over and out.